Magdeburg is a days tour from my place, involving a lot of driving, but I'm going to share the job with my father who furtunately likes the Middle Ages, too. We plan to go come Sunday. I still have some pics from last years tour to share, so here's a detail from the interior of the cathedral. 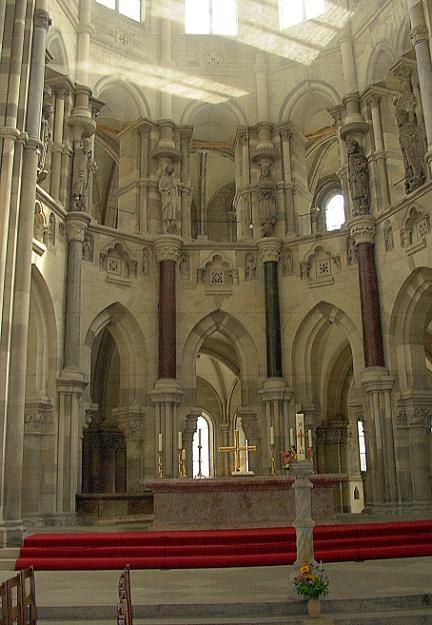 Otto I (the Great, 912-973) founded a Benedictine monastery in 937, destined to be the burial place for him and his wife Editha. In 968, Magdeburg became seat of an archbishop, in this context the cathedral St. Maurice was enlarged and beautifully equipped with antique porphyr and marble pillars Otto had brought all the way from Ravenna in Italy, together with a collection of relics. During an incendiary in 1207 most of the cathedral was destroyed, only a few items from the interior decoration could be saved. Two years later, a new cathedral was built in the place, the first Gothic church in Germany. The main part of the cathedral was finished in 1363 (took them some time, lol) but the towers were finished only in 1520. Money problems seem to have been one of the reasons for the delay. The Magdeburg cathedral is even today one of the largest Gothic churches in Germans, the main hall is 120 metres long and the ceiling vaults are 34 metres above ground, the towers rise to 104 metres. The cathedral was badly damanged in WW2 and rebuilt in 1955. Additional repairs are taking place since the German reunion. The porphyr pillars in the middle of the picture are from the original building Otto I commissioned. Ya gotta love the Ottonians. Ya also gotta love porphyr pillars. How... imperial. The only thing wilder than that are the gold leaf and lapis lazuli columns on the tomb of St Ignatius in Rome. That's a lovely photo, Gariele. Thanks, Liam. Yes, the Ottonians are an interesting lot. As are the Staufer (esp. Friedrich Barbarossa and Friedrich II). Gabriele, nice photo. I like porphry ... unrelated, but cats sometimes have reddish tears which are called porphyry. Thanks Crystal. Didn't know about cats' tears. My earlier comment seems to have disappeared, so I'll just say lovely photo, Gabriele. And I could now tell you all about how it helped legitimise and increase his power, and how future Kings used it to do the same. Or I could just admire the pretty pictures :). indeed, commissioning churches always was a political act, too.